MatTek manufactures and stocks a complete range of mats for commercial and industrial applications. We have the facilities and capabilities to manufacture to your required size shape or even custom design. With facilities located throughout Australia, we offer the largest range and the quickest turnaround. View our complete range below or contact us today. We offer a complete range of mats for commercial and industrial applications and can custom manufacture to size, shape and even custom imprint your logo. Whether you are looking for a mat to place at the front door to remove dirt and particles from the shoes, or dry your feet and collect water or a mat to provide comfort underfoot, MatTek has the experience and the resource to recommend, supply and install the most effective and suitable solution. Anti Slip. These mats are designed to provide traction and prevent slips and falls. We have a complete range of options that are non-slip and can be used on various floor surfaces and in indoor or outdoor applications. Anti-Fatigue (Dry Area) are great for use in warehouses at packing benches, in stores where checkout staff are standing for extended periods, along production lines and at concierge desks in shopping centres and hotels to ensure staff are kept comfortable and prevent the development of long term injuries caused by constant standing such as back pain, aching legs and blood vessel damage. Anti-Fatigue (Wet Area) provide worker comfort and safety in wet areas. These can be used in areas that are exposed to moisture or liquids such as bars, laboratories, food preparation areas and any other wet areas and can be made in unique formulas to resist chemicals, greases, acids or other fluids. Chair Mats. MatTek is the manufacturer of the Anchormat brand of chairmats. These are the most durable and longest lasting chair mats covered with a 5 year warranty and are manufactured from pure PVC that is twice extruded. Anchormat is the most popular and the longest serving chair mat brand in Australia and do not emit harmful odours like other common imported options. Commercial Entrance Matting Runners can be used to create an attractive building environment while protecting the floor from dust dirt and debris and collecting moisture that is brought into the building avoiding risks like slips and falls. These can be custom cut to length and width or be custom made to fill a recess or an entire area. Entrance (Indoor) are a great way to collect moisture and fine dust and debris as people enter your building. These mats are used internally or undercover as a final defence to keep your floors clean and safe and reduce cleaning and maintenance costs by protesting the floor coverings. These mats are available for a variety of floor surfaces. Entrance (Outdoor) have been designed as the first line of defence at your doorway. These mats are manufactured using materials that will stand up to the external elements and are crafted with a unique design to ensure that they perform. We have a complete range of outdoor mats that will remove heavy debris, mud, sand, dirt, grit and other street grime by scraping the shoe and effectively containing it within the mat to prevent the next person from walking it further into the building. Floor Coverings are a great way to temporarily protect floors during renovations, de fits or construction work or provide an attractive and life like atmosphere with artificial grass. MatTek produces a complete range of carpet floor coverings for light or economical usage through to heavy duty indoor or outdoor carpets that are UV resistant and suitable for marine applications. Logo Mats give you the opportunity to showcase your logo, message or even images on an effective and long-lasting mat. We offer a complete range of imprinting options that we manufacture in house to ensure a perfect solution to your design and application. Whether you are looking for an indoor or outdoor solution for low medium or high traffic we can custom make your solution quickly. Miscellaneous items, we offer a range of associated products to complement our mat range. Adhesives to fix your mats into a recess, joining tapes to allow you to connect mats together, non-trip edging or nosing to finish of mat edges neatly and safely, cable protectors to prevent trips and falls and non slip tapes to provide traction on slippery surfaces. Modular Safety allow mats to be linked together easily to form your desired shape or size. 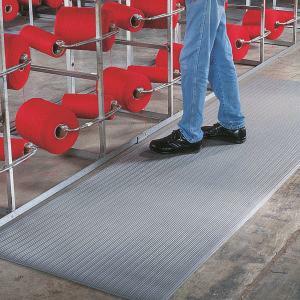 We produce modular safety mats that provide comfort under foot or high levels of traction to prevent slips and falls. DIY kits are a great way to continually improve and develop your workplace matting systems. Specialised Safety include anti-static mats for assembly areas creating sensitive equipment or to prevent workers from experiencing static shocks, nonconductive matting for workers working on highly conductive switchboards or powerlines and fire proof and welding mats for demanding areas exposed to sparks and flames. MatTek is proud to offer the largest range of mats in Australia. We can custom make mats to width, length or shape and have the ability to imprint in house. Aside from supply throughout Australia, MatTek also has an installation crew located in every part of the country to ensure trouble free installations everytime. Get in touch today if you require any assistance in making sure you receive a solution that works.